September was markedly more expensive than the past several months due to a panoply of miscellaneous occurrences. Most notably, we booked flights to Chicago for my cousin’s wedding, which takes place in a few short weeks. Time with family is something we value tremendously and so spending money on these plane tickets was an easy decision to make. It’s also the beauty of living the uber frugal life–when we want to travel, we just do because we can easily afford it. We probably could’ve gotten a better deal if we’d booked farther in advance, however… due to the fact that I’ll be 34 weeks pregnant when we travel, we wanted to wait until the last possible minute to solidify our plans. Fortunately, I’m feeling fantastic and my doctor said I’m fit and fine to fly. I am so incredibly thankful that I’m having such an easy pregnancy! I continue to practice yoga, eat well, and just generally feel great. I’ve been very mindful of my diet and exercise regime throughout pregnancy, which I think contributes to how stellar I’m feeling. 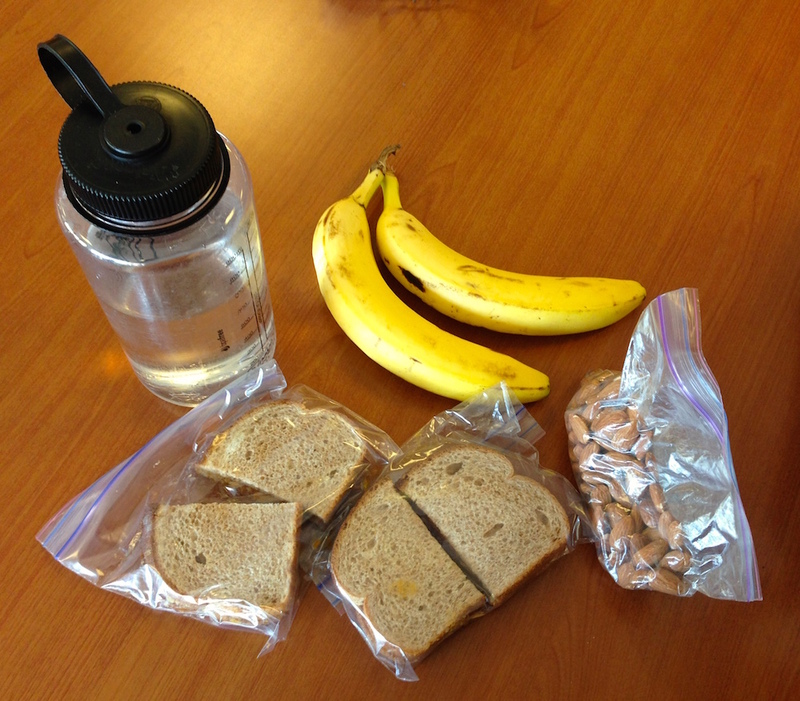 The lunch we packed for class: PB sandwiches, almonds, bananas! Classic frugal weirdo moments of attending this class: we were the only people who packed our lunch vs. bought it in the cafeteria; I was the only person who asked questions related to expenses surrounding baby’s birth; we were certainly the most excited class participants to learn about the free, fully-stocked pantry of snacks, sodas, and coffee on the maternity floor. You should’ve seen the look of sheer joy we exchanged when they casually mentioned all the free food we could consume before, during, and after her birth. Score! Although this month saw us spend a whopping $1,645.99 in non-mortgage expenses, we’re not concerned because all of our purchases were in line with our overarching goals. Since we don’t budget or check-in on our expenses during the month, it’s key for us to always operate from a place of values-based spending. When you know you’re only forking over cash for stuff you actually care about, the total dollar amount is almost immaterial. Plus, we’ve learned that pricey months like this one balance out with super thrifty months like June’s $793.90 and August’s $843.42. Thanks to this, we find that we spend an average of $1,000 per month. 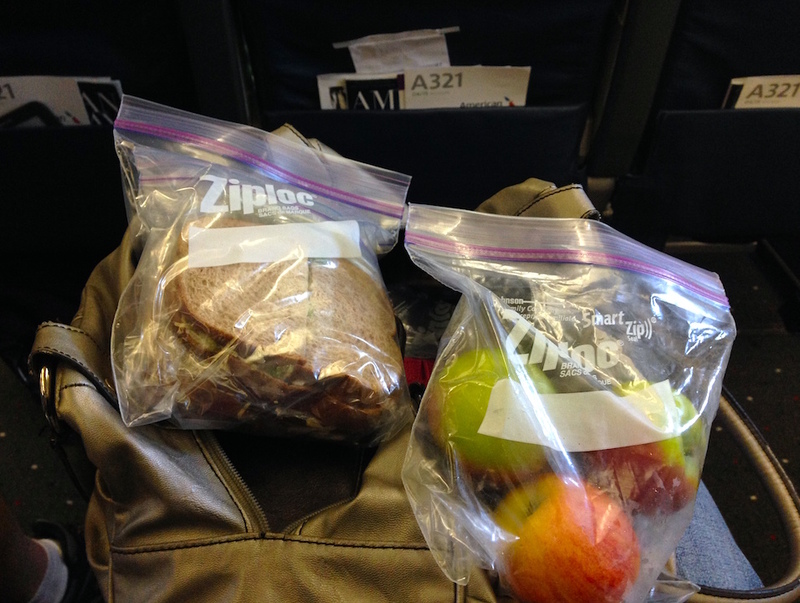 The lunch we packed for our flight to Charlotte: chicken salad sandwiches & apples! Any way you want! As regular readers know, we itemize every single dollar we spend (which is why there’s a line item for $2 this month). I do this because it’s the most transparent articulation of how we allocate our resources and managed to save 71% of our take-home pay in 2014 (not counting maxing out our 401Ks). Want to know how we manage the rest of our monies? Look no further than How We Manage Our Household Finances. Why do we save so much and spend so little? It’s all in service of our goal to reach financial independence by age 33 and move to a homestead in the woods. Wondering about some common expenses that you don’t see listed below? Our August 2015 expense report has the answers you seek! Airfare (two round-trip tickets to Chicago) $392.40 One of my cousins is getting married this month and we’re excited to head out to the midwest to celebrate with my family! This is the type of money we don’t hesitate to spend. Groceries $356.34 A tad high this month, which balances out last month’s dirt cheap $200.33 grocery bill. Rental car $153.39 Our one-way rental car, which we drove from North Carolina to Boston in one day. Find out why! Frugal Hound’s vet exam and vaccinations $116.00 Frugal Hound’s annual vet exam and vaccinations. Read all about how we frugally hack doggie care. Home improvement supplies $113.97 Tools and materials for various home improvement projects around the ol’ abode. Gasoline for rental car $71.94 The gas we purchased for our rental car. Gasoline for Frugalwoods-mobile $35.67 The gas we purchased for our own car. Utilities: Electric (covers August) $104.83 August was likely our highest air-conditioning usage month, plus, it was before we pulled the plug on monster fridge. Looking forward to lower bills in the future! Household goods from Costco $65.30 Household supplies (including such things as dog food, toothpaste, toilet paper, vitamins, and more). This total does not include any human food. Costco membership $55.00 Our annual Costco membership, which is worth it to us for the savings we reap on dog food alone! Heartworm medication for Frugal Hound $41.97 Six-month supply of heartworm prevention meds for Frugal Hound. Utilities: Gas $20.23 I can’t think of anything witty or clever to say about our gas bill. It’s gas, we pay it, the end. Public transportation $20.00 Mr. FW added money to his subway pass. This’ll last him quite awhile since we usually walk or bike in lieu of taking the train. Prenatal vitamins $5.00 Gotta keep Babywoods healthy! Parking meter $2.00 Had to pay for a parking meter in the city of Boston. Boo. What do you think of our expenses? How was your September? Thanks! We’re excited to see them! Also the booger suckers! I don’t think we scored diapers and wipes (or maybe we did and they went so fast that I forgot it in the sleep deprivation haze). What we did go home with: plastic bowl & plastic pitcher (for ice water in the room), plus misc medical supplies: lanolin, nursing pads, adult diapers, gigantic maxi pads, sitz bath, peri bottle, some sort of hemorrhoid wipes? They were very specific about how to soothe, clean and wipe those “delicate areas” after the beating that is baby delivery. On the food: our childbirth teacher told us that Mom could order two entrees and give the second to Dad. Score! However no such luck for us, Lowell General Hospital changed that policy shortly before our daughter was born and my husband ended up in the cafeteria for meals. Awesome! Can’t wait to stock up on free baby supplies ;)! And hey, who doesn’t need some hemorrhoid wipes and gigantic pads ;). In all seriousness, I know we’ll need them and I’m super excited at the prospect of all these handouts. This is a good frugal tip for anyone who is ever in the hospital for any reason. Take all supplies home with you (ask the nurse to point out what is yours if you are unsure.) I used to work for a big hospital system and trust me — you are billed for everything and most will be thrown out if you don’t take it home. I still use a plastic pitcher from a long-ago hospitalization — I use it to water house plants and to rinse the dog when it’s time for her bath. I also have several pairs of slipper socks I picked up in the hospital. I had some recent surgery. The nurses were wonderful. When I said I wasn’t really up to trying to stuff all the supplies into my little bag and would just leave them they brought me in a ‘patient belongings’ bag and made sure I knew what would be thrown away if it was left behind. I have a charity I donate material goods to so I figured if we didn’t use the supplies at home I could always donate them and they wouldn’t become clutter. Great idea about donating the items you couldn’t use to charity! I cannot stress how fortunate you are to have your health insurance, phone plans, and recycling/trash fully covered by other sources. Despite choosing the most affordable plans possible (don’t get me stated on how horrible high deductible plans are if you get sick–which happened to both my perfectly healthy husband and I last year) our expenses for these items are nearly your entire operating budget (outside of mortgage) for the month. Changing jobs/location is not feasible for us, due to the husbands extremely competitive job market. But! We did save $250 on our grocery bill this month and have stopped eating out completely. But I wish we could change some of those fixed expenses. Congrats on your month. Unfortunately, our trash, water, sewer and recycling are one lump cost by the city. We did realize that good health insurance, while expensive, is a must (emergency eye surgery and idiopathic a-fib, despite excellent overall health). We have a very competitive phone plan. However, our car insurance is very high (in a city with no public transport, so we need a car) despite our hunting for a bargain and a 14 year old car. When husbands job can change, we are out of here! But grateful for the job nonetheless. Also! Mr and Mrs F–when I reply to a comment, the fields populate with someone else’s contact info! Enjoy the wedding! Traveling to visit family is certainly an important value to us, too. I’d love to read about your LASIK surgery experience as we’ve considered it but haven’t been brave enough yet. Even with your “extras” it was an amazing month. We spent too much money on food and eating out in September. We had a meeting about it Tuesday and have a plan for October. The area where we had to spend money was household. We needed a new inter tube for our wheelbarrow tire (need it to move the 4 cords of food that will do a lot of house heating this winter, here in rural Quebec) and we have a mouse problem (11 trapped so far) so we had some mouse trap expenses. We have a plan for October that I think will be great. I am very happy to have found your blog. Long time reader of MMM but always good to get some new perspectives. Over here in Sweden some of the bloggers have had what we call Super Spar September (would translate to Super Saver September) which is a challenge we try to do once a year to callenge all our expenses and try to get som additonal income as well. Our spending this month was 13 000 SEK ( about 1,500 USD) including everything and since we also hade really good income we had a 89% savingsrate which was a record. I live in Chicago! Okay…well, the burbs, but Chicagoland 🙂 You’ll have a great time when you come in the for the wedding, there’s a lot of free and fun things to do here if you find yourself with extra time during your stay. Even just walking around the city is entertaining! Cheers to a fabulously frugal October! MAN…..How do you get such great air-fare pricing? Just bought ticket for DD2 to come home for Xmas from out West…..Just shy of $600….And a DF told me come December 1st I could probably double my money on the ticket….if I chose…which I won’t…. Airline ticket prices are just crazy! $400, huh? We’re flying first class on a 14 hour flight to Japan on Sunday for $161 all-in round trip. But then again, according to our recent expense report, we spent about $3,000 a month on average this quarter outside of debt payments, so I guess it really doesn’t matter! It was all thanks to that work on our backyard patio, storm recovery, and Maeby’s teeth-cleaning. Still, you gotta get some of those frequent flyer miles! Overall still a really great month! By all means take advantage of the free snacks/ loot during your hospital stay. They usually don’t like moms on active labor to eat much, if anything at all- so Mr. Frugalwoods might be the primary person to indulge pre-birth. He will need to snack for both of you! Funny how birthing practices vary from place to place (practice to practice). When I went into labor with my first child and called the midwife she actually asked me to eat something before heading to the birthing center. The birthing center didn’t offer all meals to dad but did offer a special dinner for mom and dad following delivery (or next day depending on timing). WE had lobster and mini champagne!!! I’m due with baby #3 around the same time as Mrs FW, but have chosen a home birth this go around, so meals are (unfortunately) from my kitchen! Chicago! I grew up in a suburb and spent plenty of time farting around the city! Have you been? It’s beautiful with lots of free stuff to do. I highly suggest a walk through Millennium Park with at stop at Cloud Gate. Very cool in person. From there, walk south down the lakefront path towards the Shedd Aquarium and Adler Planetarium. Go south from the Planetarium and stroll down Northerly Island. If you’re still able to ride a bike, you can do all of this through the city’s bike share program. Maybe you won’t have time or won’t be in Chicago proper, so I’ll stop there. If you will be in Chicago though and need stuff to do, hit me up! You guys keep crushing it! We clocked in another month of sub-$1,000 expenses. Groceries ate up (get it?) half of our monthly expenses, but we also stocked up on sale items and ate pretty well with lots of fresh fruits and vegetables and some fancy cheeses, fish, shrimp, etc. Otherwise, we didn’t spend much money. Our investments, on the other hand, didn’t treat us too kindly at all. 🙁 It wasn’t quite as ugly as August, but still a rough month. Oh well, they go up and they go down! Crazy good as usual….well done guys. I think this is the first month I spent less (excluding your mortgage, my rent) than the Frugalwoods! Haha – enjoy the wedding! Hey, $400 is pretty good for two round trip last minute plane tickets. After months of procrastination, I finally bought my plane ticket from Nashville to Albaquerque. We’re spending a few days in Santa Fe for my mom’s 60th birthday. Like you said, family is really important. Sometimes I have to splurge on things like this! September was defininitely this year’s most expensive month yet. I’m kind of dreading this weekend’s budget review. I spent $803 for 1 person for the month of Sept. That includes everything except a pro-rated portion of my car insurance, and property taxes which would add only about $115/mo. I really good with the low expense part but my AGI is sub-$15K/yr. I quit full time work at age 31 and am now(age 36) self employed working just enough to cover my low costs while my investments continue to climb(hopefully). I am three or four months into reading and following your blog and two months into tracking expenses (carefully). How incredibly shocking to see where money really goes! I am learning a lot! I’m glad you’re feeling great! Mine were not so great… Alas. I always love buying plane tickets because it’s purchasing an adventure… and adventure with family really is the best kind! Loved reading this, Janice. Good ideas that are not complicated. Still a great month! Do you guys have cell phones? I also loved the free food in maternity! I thought I wanted to go home right away after birth, but I had a c-section and had to stay three days. I had so much fun ordering food from the menu and demanding graham crackers at three am so I wouldn’t have to take my Percoset on an empty stomach. I was so hungry, I was ordering these huge meals. Good times. When Little Brother was born, via c-section after trial of labor, they suggested that I might be able to go home after a mere 48 hours (putting me home on a Tuesday evening). I was like, are you freakin’ kiddin’ me? I am staying every minute that I am entitled to, thankyouverymuch. For me, the most frustrating thing about September was the continued back-to-school spending. Uniforms and school supplies cost a couple hundred dollars altogether, maybe $250, and a lot of it was stuff I wouldn’t normally buy like giant tubs of disinfectant wipes and $8 t-shirts. (Big Brother’s polos were TEN. I don’t buy ten dollar shirts for MYSELF. I usually get theirs at Goodwill for $1.99. Sigh.) Otherwise, we did well. We have finally stopped hemorrhaging money on spiffing up the house and my playground resurfacing project came in way under budget. $10 is cheap for uniform polos! I work at a boarding school, and you wouldn’t believe how expensive the uniform stuff is. Every year, I collect and wash uniform pieces from kids who are leaving. I reallocate to faculty/staff kids first (we do get the perk of free tuition, tho we have to pay all the fees, which are increasing a lot these days). Then, we put out stuff during the first week of school. Getting enough uniform pieces to make it through a week really adds up. September was a much better month for me than the summer. We’ve managed to get our good spending back in line, which was a huge problem area due to summer travels. I’m definitely looking forward to cooler weather and turning off the AC! Of course the downside is that the gas and electric bills flip and gas becomes crazy expensive all winter long. 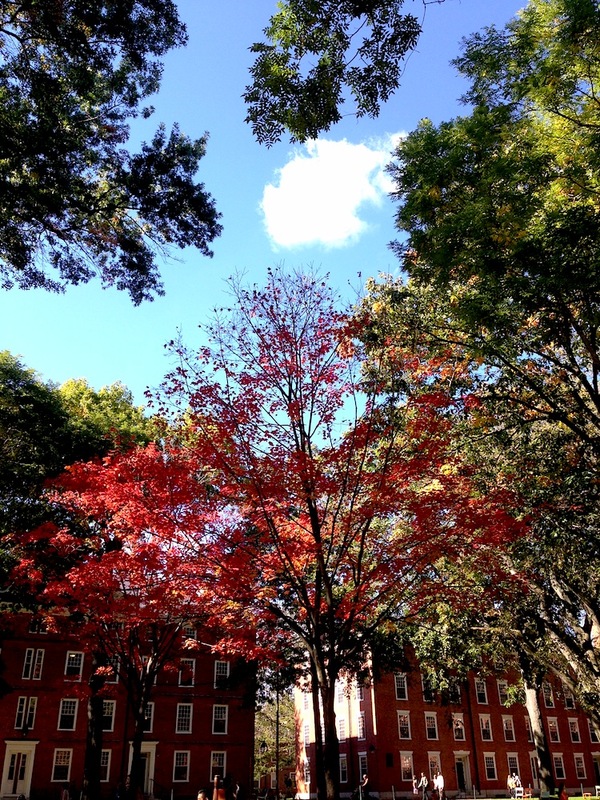 Oh well, we’ll enjoy the few weeks of temperature-control-free fall while we have it! If you guys need anything while you are here in Chicago, shoot me an email I’ll do my best to help out! Enjoy the wedding. I can’t believe it’s so cheap to fly in the US. Here in Canada flying from Vancouver to Calgary will set you back at least $300 for a return trip. Well done! Take advantage of those snacks after birth (though before and during are unlikely to appeal)- I’ve never been hungrier in my life than I was after giving birth, and I’ve run marathons. How much it cost and everything else! I think the mindset you guys have is on the rare side and pretty amazing. If I went about my finances only spending on what is important, I would be in the shoe store like, “Well, these shoes are important…” haha! I need pretty strict guidelines with a little flexibility (very little) built in. I find your posts thought-provoking. Thanks! Where do you get your Heartworm meds? That is a good price! We actually just get them through our vet. I checked online to see if we could get them cheaper anywhere else, but wasn’t able to find a better price. Are you local? If so, our vet is the Huron Vet Hospital (which we’ve been really happy with): http://www.huronvethospital.com. Good luck! You should try Costco. They sell pet meds and with your Costco membership you’ll get the ‘Costco member prescription plan’ and save even more. I think in the mid $20’s for 6 month supply of heartworm meds. Glad to find your website. Dividend Mantra claimed to be the only blogger to show all of his monthly expenses. I guess not. Good to know re. Costco pet meds! Thank you for the tip. I will have to check that out. Glad you found us :)! Great month! When I noticed that you spent money on airfare I wondered why you weren’t using travel hacking techniques to get free flights. However, you’re really not much of a candidate for credit card churning if you’re only spending 1k/month. Better to just shell out the airfare costs than increase your annually spending to take advantage of credit card promos. I would love to see a post on your LASIK procedure that includes how much it cost and how you selected a clinic for the procedure. I am so tired of spending on contacts and glasses! I’ve heard it stills costs several thousand dollars plus several hundred dollars for eye drops post-op. I just got back, literally 10 minutes ago, from my first real shopping trip to Market Basket, and I’m kind of in shock. I’ve lived in Cambridge for over three years and have been shopping mainly at Whole Foods (because it’s on my walk home from work), but I decided to try Market Basket today, ONLY because I discovered your blog earlier this week and have read perhaps 47 posts in which you wax poetic about Market Basket. Man, I had NO IDEA. I had heard that Market Basket was cheap, but this was like some kind of alternate universe. I do not understand how this place can exist. Also, the people working there were so nice, and at one point they made an announcement that it was one of the cashier’s birthday tomorrow so everyone should come sing happy birthday to her on their way out! On a related note, I have also decided that I am challenging myself to abstain from restaurants and takeout food for the entire month of October, which is going to be a huge change for me, but I’m so excited about Market Basket that I think it will be fun! Anyway, please excuse the super long comment; I mostly just wanted to say thank you!!! That’s AWESOME!!! I am so excited to hear this! Market Basket is seriously amazing. I was actually there last night too–sorry I missed you! I think a lot of folks don’t realize just how inexpensive and high quality it is. I am consistently blown away by the low prices and awesome food. So glad to hear you’re a convert ;). And, good luck on the restaurant and take-out ban–you can do it! Yeah, now I completely understand why it was such a big deal when MB was closed last year due to the Arthur T. vs. Arthur S. conflict (which I know about because it was covered extensively on WBUR). I remember hearing that when it reopened there were balloons and people celebrating in the aisles! Also, I can’t believe they have organic vegetables!! Usually that is the last thing you would find at a cheap supermarket. Thanks for the encouragement — this month is definitely going to be an interesting challenge for me! That is so great that you are feeling so well. You might make it right to birth too. I felt fine that I work right up until the day right before I had my kids. But you are way courageous, I was way too afraid to travel in a plane pregnant. Also I want to do a survey all ladies please reply, but did they actually say you, ( the pregnant lady ) could eat before and during labor? I think they told me the same thing but from experience I was not allowed to eat once I was checked into the hospital. Basically when you are in active enough labor that they check you in… Most hospitals will turn you away if you are not far enough along. So the question I have and would like to know is were you allowed to eat once you were checked in, and please be destinct with hospitals, as I know things run differently at home births and other alternatives. Just so you can also get a feel of what might happen. Because I was upset about not eating anything from 8 am until 5 pm. I understand why they do it but I still think it’s silly. I had my SO sneak me a nut or 2. 😉 I mean we need energy during this process. I had never fasted before actually the opposite I eat all the time… So it was a big difference for me… I guess it might not be a big a deal if you have a different diet. I had the same experience in a Pittsburgh hospital. I was not allowed to eat. Checked in at 8:30am and delivered just before 6pm. Only ice chips. I had pre-eclampsia post-delivery. Like you I did sneak some nuts. I then was allowed a clear diet for the next 24 hours. Lets just say I was not a happy camper. I have a super fast metabolism and eat something every 2-3 hours. I’ve always been somewhat under weight but eat more than most men. When I look at what Mrs. FW eats, I would be ravenous/hangry all the time. Oatmeal only sticks with me for about hour before I’m hungry again. I don’t eat much meat, but plenty of eggs, cheese, nuts and beans. Haha when I read each of your expenses line by line they all don’t seem to be much. But add them all up and you get $1645.99! By the way, how do you account for credit card cash back? Assuming you use them of course (I assume you use rewards earning cc’s, but not necessarily cash back ones). I had a “no spend month.” I tried not to spend money on anything besides rent, utilities, and groceries. Except for a $2.45 purchase of some disposable cups, which I bought at the beginning of the month when I forgot I had my no spend September going on haha. I got pretty close to my goal. I still bought just a few things that weren’t groceries, but in all, I only spent $187.92 outside of rent and utilities last month. Good question on the credit cards. We have a Starwood Preferred Guest card, which accrues hotel points that we use primarily on hotels for international travel. We also have the Amazon cash back card, and we use that cash for purchases on Amazon. Great job on having such an amazingly low spend month! September was awful for us as we paid off bathroom renovations. This month I hope to have a much better month. I am planning a career move for me in a few years and we need to save as much as we can to make this possible. I’m definitely on a quest to live my life on my own terms. Here’s a weird frugal tip for the birth plan – take your own bottle of Tylenol! After my first son was born, the hospital gave me a total of 4 Tylenol for discomfort and swelling. Not fancy prescription Tylenol – just regular stuff. On my hospital bill afterwards, I nearly fainted when I saw the charge of $60 for those 4 pills! Second baby – I took my own. Ironically enough, I didn’t need any of them, but I was prepared! By the way, I mentioned that expense to my doctor later at a follow-up exam and he was horrified! He had no idea! Yes, the charge for plain old Tylenol is ridiculous. If you have any meds you take regularly, take them with you. But you may have to argue with the nurses not to give you theirs, and call the billing office later to have the charge removed — in some places it’s automatically added. Well worth the effort, though. Even if you have good insurance that covers everything, no sense jacking up the costs for everyone. And doctors have no idea of the cost of medications. My doctor wrote a script for me for an ulcer drug that was going to cost me $300 a month. I called his office and told him there was no way I was paying that much. He was shocked at the cost and told me an over the counter medicine I could take that he thought would work just as well. And it did. So I always think it’s a good idea to let doctors know about these things. My nurses wouldn’t allow that. Thankfully, my insurance negotiates a flat rate for the hospital stay, so I didn’t have to pay every line item charge. What no one told me was that I’d be charged separately for the baby the second she came out of my body. So, I had bills for me and bills for her. That never occurred to me to even ask about. Then, when I complained after (to my HR lady for not explaining), she said “of course; isn’t it obvious that your insurance only covers you?” So, 5 days post-birth, I was sitting in my HR office doing the paperwork to put the baby on insurance so that the hospital stay could be covered. Not a huge deal, since I live at the same place where I work, but it was just another thing to have to think about. Just a FYI, if you do take your own Tylenol, be sure to let the nurses know. I had two surgeries and three hospital stays last year and decided to take my own Gas-x. The doctor wanted me to let the nurses know when I took one. (Oh and that was generic Gas-x for about one third the price lol). September was more expensive for us as it was back to school time which meant sport fees, volleyball shoes (my daughter did try to repair her old shoes with glue) and knee pads, school related fees, more gas and some school supplies. We also had 2 birthdays which included a large amount of pizzas being ordered. (thankfully my mom ordered them on $10 day, with extra coupons and received free cookie dough) We also splurged on a trip to the beach for our family of 7, but saved by bringing all of our food and cooking all meals in our hotel kitchenette. (plus the kids enjoyed the free hot chocolate in the lobby) The retirement investments took a hit and the Craigslist side hustle has been slow. However got some specials on gift cards to use on household expenses and Old Navy credit is doubling points which means more rewards for future Christmas gifts. I like that you posted your food pics. I tend to be lazy on trips and spend too much on food. What type food do you take to work and stay healthy….and not get sick of it! Im running into the problem of getting bored with food from home. Healthy food tends to be a lot more expensive too. Ideas? Hi Megan! People do calculate savings rates differently and there’s really no one right way to do it. 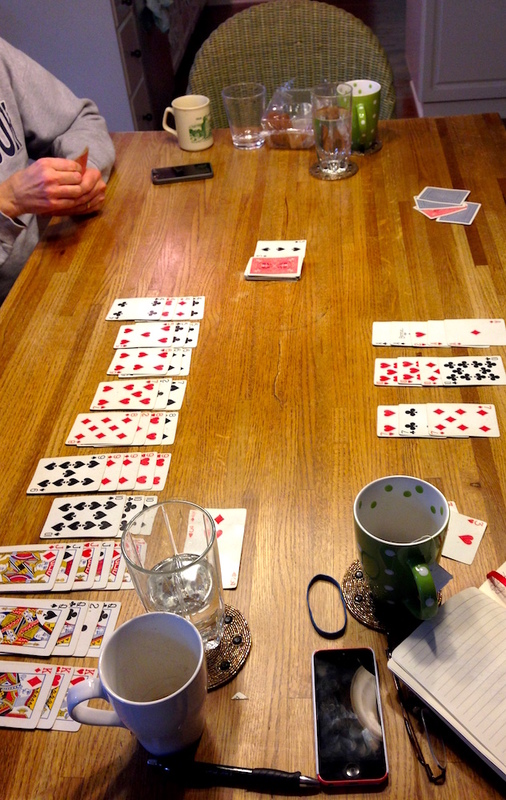 Here’s our post on how we calculate our 71%: Well Hot Damn, Frugality Works! Our 2014 Savings Rate Revealed. Interesting. I take my gross monthly paycheck, subtract taxes and pretax benefit payments (part of my paycheck goes to healthcare coverage) and then i divide my monthly investments (pre and post tax) from that remainder. Im around 70% each month. I would love to hear about your Lasik experience. Did insurance cover any? Defiantly something I have been thinking about and would love to know more from a frugal perspective. I’m not sure what’s available in the Boston area, but Meijer and ShopRite offer free prenatal vitamins in the midwest as do many other chains. I know it’s only a $5.00 line item, but hey, free is free. Also, if you’re planning on breastfeeding most physician’s recommend that you continue taking prenatal vitamins for the duration of the breastfeeding relationship.